Metromaxq Security Units protect valuable equipment and sensitive items from pilferage. Heavy gauge open wire allows air circulation and visibility while protecting items. 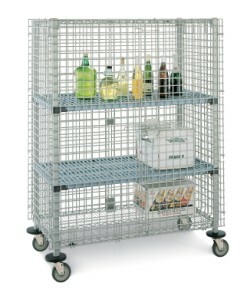 MetroMax Q wire cages are a clean and durable security storage option for wet/damp environments. Because corrosion resistant epoxy coated cages have built-in Microban product protection to inhibit the growth of microorganisms that cause odors and product degradation. Furthermore, optional middle shelves, also with Microban product protection, offer removable plastic shelf mats to support easy, routine cleaning. • Metromaxq Security Units offer secure storage with visual access to supplies: Additionally, stored items are secured behind the wire cage but are easily visible to manage inventory. • Optional intermediate shelves can be repositioned on 1” (25mm) spacing. Quick-adjust corrosion resistant MetroMax Q shelves and corrosion proof MetroMax i shelves are available. • Cages, shelves, and posts include Microban antimicrobial product protection to inhibit the growth of bacteria, mold., mildew, and fungus that cause product degradation. • Likewise doors swivel 270° and may be attached to the sides of the unit using hooks (included). This allows the unit to be loaded and unloaded easily. • Ergonomic turn-key handle for easy operation. Doors can be locked (locks not included).